United Counties Premier Division leaders Yaxley came from behind to maintain their six-point advantage at the top of the table today (March 17). Things looked grim for the Cuckoos when hosts Harborough took the lead from a controversially-awarded penalty, but Phil Stebbing and Tom Waumsley struck to secure a 2-1 win. Jake Mason (left) celebrates his goal for Peterborough Northern Star against Cogenhoe with James Hill-Seekings. Photo: Chantelle McDonald. @cmcdphotos. 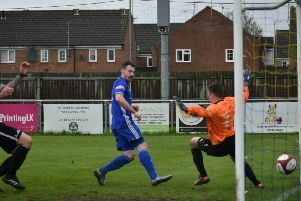 Second-placed Wisbech Town have three games in hand on Yaxley and they served notice of their intention to make it a thrilling end to the season with a 6-3 home win over Leicester Nirvana. The Fenmen were 5-0 up after 30 minutes before easing off. Jamie Stevens (2), Alex Beck, Josh Ford, Michael Frew and a Danny Setchell penalty delivered the points to Wisbech. Newport Pagnell, who started the day in second, and Holbeach United, who were fourth, saw their games postponed. Deeping Rangers moved above Holbeach after a 3-1 win at Kirby Muxloe courtesy of Scott Mooney (2) and Scott Coupland. All the goals arrived in the first-half. Deeping can catch Wisbech on points with a win at Nirvana on Tuesday (March 20). Wayne Morris (left) and Dan Smith (right) in action for Peterborough Northern Star against Cogenhoe. Photo: Chantelle McDonald. @cmcdphotos. It’s now eight Premier Division games without a win for Peterborough Northern Star (seven defeats) after a 2-1 reverse at home to Cogenhoe. but the city side felt they were unlucky losers. Jake Mason pulled a goal back for Star in the second half and hit the post a few minutes later. Division One leaders Pinchbeck United’s trip to Irchester was called off, but Bourne and Huntingdon Town served up a decent game at the Abbey Lawns. If finished all square at 1-1 with Zak Munton cancelling out Jake Waterworth’s first-half goal for Huntingdon 20 minutes from time. Huntingdon had lost their previous five games. Stamford AFC consolidated their place in the play-off places in Division One South of the Evo Stik League with a hard-fought 1-0 home win over Leek Town. Leek had beaten The Daniels by the same score on their own turf the previous weekend, but Kieran Wells’ 23rd-minute goal - his first for the club - was enough to keep Stamford in fifth place, five points clear of their victims who are sixth. Danny Brooks 11th minute penalty gave Spalding the lead at home to Belper, but the visitors equalised early in the second-half. Peterborough Sports were without a fixture, but remain 16th, six places and six point clear of the one relegation spot. Spalding travel to lowly Gresley on Tuesday. Wisbech St Mary won a battle of two struggling Eastern Counties Division One sides, 3-1 over Team Bury. Division One South: Spalding United 1 (Brooks), Belper Town 1; Stamford 1 (Wells), Leek Town 0. Premier Division: Harborough Town 1 (Stebbing, Waumsley), Yaxley 2; Kirby Muxloe 1, Deeping Rangers 3 (Mooney 2, Coupland); Peterborough Northern Star 1 (Mason), Cogenhoe United 2; Wisbech Town 6 (Stevens 2, Beck, Ford, Frew, Srtchell), Leicester Nirvana 3. Division One: Bourne Town 1 (Munton), Huntingdon Town 1 (Waterworth). Postponed: Irchester United v Pinchbeck United. Division One: Wisbech St Mary 3, Team Bury 1.